We hiked, we got wet, we explored, we saw, we photographed and we complained. That’s all part of touring the Ecuador rainforest. And we got to hang out – a disparate group of 15, from different parts of the world, different ages and backgrounds and with every experience it bonded us together. We told stories, we laughed, we sang – we became a pack. Thanks to the extremes of each day, we prized our time in between adventures, yet we didn’t isolate, we spent them together. It’s a benefit that seems to be more elusive to me as I get older. Being in school, university and a series of offices led me to have groups of friends – but when I went freelance, it became very individual. I have preferred travelling on my own or with a close friend, but my experience in the rainforest made me realize the benefit of being in a group. For the support, the points of view, the learning and the tolerance. And so we spent time in our shared space – the hammock area. We were drawn to the area – from early after the sun rose to the quiet of the night. 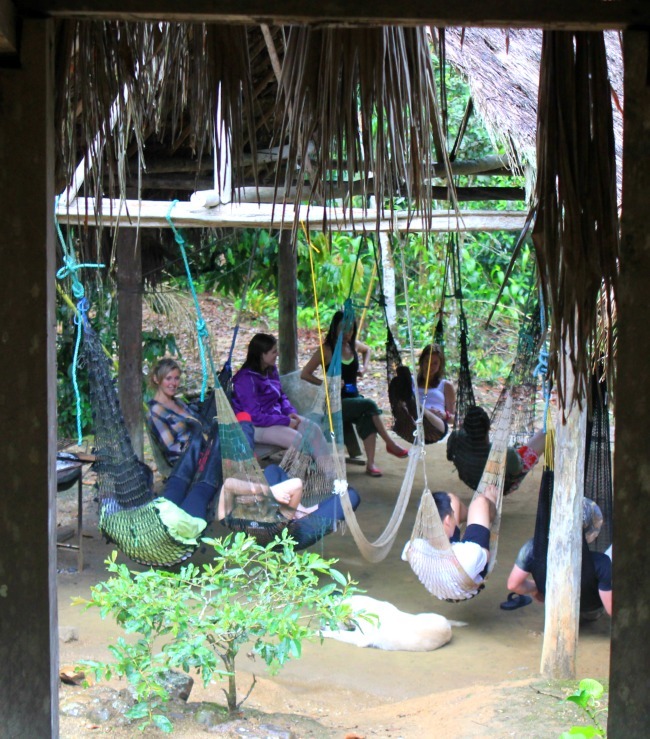 We napped, we talked, played with the local kids and started games – like combat hammock. As someone who is always observing, it was a time to watch as we became one – a unit that had its rules, its own song (Ring of Fire) and a lasting effect on us all.